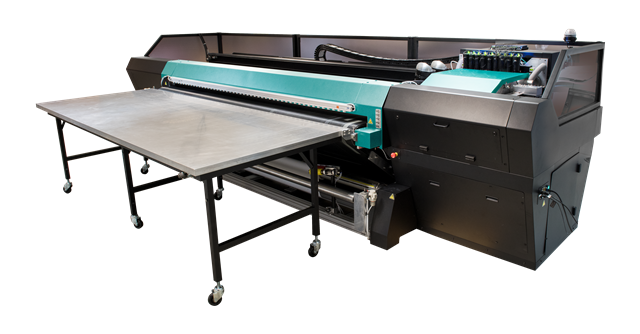 The Uvistar Hybrid 320 is a 3.2 meter, combination flatbed and roll printer that provides the throughput capability and flexibility to win more work. The Uvistar Hybrid is capable of producing output at speeds of up 2,100 ft2 per hour. The Uvistar Hybrid 320 delivers bright, vibrant colors and the inclusion of orange ink greatly increases the color gamut. This full greyscale device prints exceptional quality with its 10-30 picoliter VersaDrop™ variable drop technology. The Uvistar Hybrid 320 is available as an 8 or 9-channel printer. The 9-channel printer features the addition of white ink, which further extends the range of applications. White ink allows for layered printing over or under an image, or it can be used as a spot color. Several innovative technologies come together to provide you this breakthrough in hybrid production speed, quality and flexibility. Fujifilm Dimatix Q-Class printheads jet straight and fast for accurate dot placement, while greyscale VersaDrop technology automatically adjusts the size of the drop (10-30 pL) to meet the desired level of detail – small drops for smooth gradations and fine text and larger drops for excellent coverage in areas of solid color. Taking full advantage of eight ink channels, the Uvistar Hybrid 320 produces outstanding image quality. 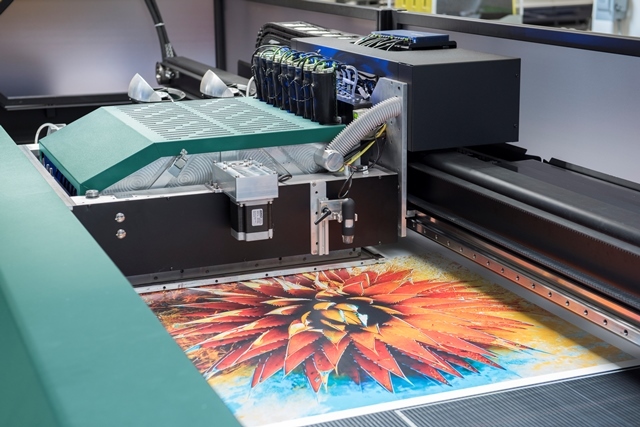 The Uvistar Hybrid combines light colors (Lc, Lm and Lk) with the Orange and CMYK to dramatically boost performance to speeds up to 2,100 square feet per hour. There are several unique features that truly sets the Uvistar Hybrid 320 apart from other hybrid presses, including the patented tri-lobal belt system. This system dramatically minimizes skew by ensuring best-of-class media track accuracy with flexible and rigid substrates. The unique tri-lobal belt design includes a third tensioning roller which ensures the two primary rolls remain perfectly parallel. 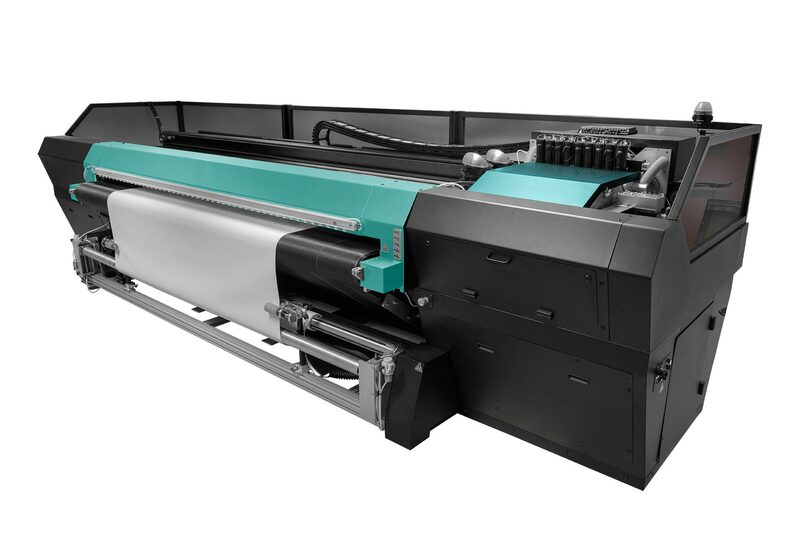 The press also has a three-zone intelligent vacuum system that applies the right amount of vacuum depending on the type of material being printed. Each of the three vacuum zones are split into front and rear sections and each of the sections are controlled by a variable vacuum pump. This results in a total of 6 vacuum pumps, each dynamically adjusting vacuum pressure to apply the right amount of vacuum where you need it, depending on the type of material being printed. The high performance tension bar with spreaders keeps even the most difficult roll media from wrinkling before it enters the print area. The spreaders clamp the outside edges of flexible media to provide tension, minimize wrinkles, and effectively guide the media throughout the process. The Continuous Board mode increases productivity when feeding multiple sheets of the same stock during production. This mode offers time savings between sheets as the print carriage continues moving. No time is lost due to the carriage returning to its park position, requiring the job to be started again. Uvijet US ink provides excellent adhesion to a broad range of substrates. The 8-color press includes CMYK, Lc, Lm, Lk, and orange. The 9-color model adds white. The lights smooth images and orange expands the color gamut and enables matching Pantone and corporate brand colors. The highly opaque white provides excellent coverage. The Uvistar Hybrid 320 utilizes Fujifilm Dimatix Q-Class printheads. Q-Class printheads jet straight and fast for accurate dot placement while greyscale VersaDrop technology automatically adjusts the size of the drop (10-30 pL) to meet the desired level of detail. The Uvistar Hybrid 320 has 8 printheads per channel. The Uvijet US ink system was developed for the the Uvistar Hybrid 320 and it provides excellent adhesion to a broad range of substrates. The 8-color press includes CMYK, Lc, Lm, Lk, and orange. The 9-color model adds white.